Who said you're not a good test- taker? Take a test ride on a new or used Harley-Davidson® Motorcycle. 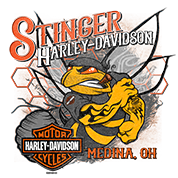 Stinger Harley-Davidson® is a dealership in Medina, Ohio. We offer a wide selection of new and used motorcycles for sale in Medina, Ohio serving the Greater Cleveland & Greater Akron area. We offer financing, a full parts & service department and motor clothes. Visit Stinger Harley-Davidson for all of your new or used motorcycle service needs for your Sportster®, Dyna®, Softail®, Touring or Trike.